Homeward Bound CT wants to be sure you know the rescues we work with. Below is a list of local and out of state rescues that Homeward Bound supports. These rescues are invited to our events when we have them but they always have dogs. So when we aren't hosting an event we hope you will visit their sites and see what dogs are available. Please visit their sites and always feel free to donate directly to any of them. All of these rescues work diligently on making sure their dogs are happy, healthy and find their forever homes. Phillipa Scott "Scotty" is always helping dogs from Texas. Please visit their website for available dogs. Tony and Marina are always helping dogs in need. Local and out of state. 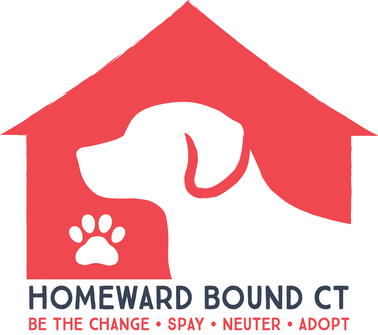 If Homeward Bound is not having an event please visit their site to see if they have a dog that will fit your needs. We are a small 501c3 non profit group helping dogs find furever homes. Most of our dogs come from high kill shelters from the south. Our dogs are all in foster homes with other dogs, some with kids and cats. With our dogs being in foster care we can tell you how they are in the home. CT Animal House is always helping our local dogs. Please visit their website to see who they have available. Halfway Home Rescue is based out of Woodbridge, CT and has placed over 5,000 dogs and cats in their forever homes since they started in 2004. Visit their website to see their animals available for adoption. Purrs, Paws and Claws is a small rescue helping out the unwanted pets find loving homes. I strive to match the perfect dog, cat, pig, goat etc.. with the perfect family. If I do not have something that you are looking for I will try to find another rescue that may have what you want. I am currently not taking in any more cats or kittens at this time. We are currently still pulling dogs from the shelter as well as taking in dogs from families that can no longer care for them Everyone must remember that most of my pets are from the shelter. We have no history on these pets and cannot say for sure the temperament or the health of any pet coming thru this rescue. We take them to the vet for health checks and do our best to temperament test them the best of our ability. S.A.V.E or Southern Animal Volunteer Effort is a new partner we've worked with and we are so happy to have them join our events. Arianne McLure is our go to person and she is a joy to work with. SAVE seems to focus a lot on the little ones but has come up with some gorgeous German Short Haired Pointers too. SAVE will be joining us at our large events in May and October but as with all the other rescues well they always have dogs available in between. Visit their site to see what dogs are currently available. SHAR has worked with us from our very first event. We all know Sara Drum and she has the amazing support of Terry & Jim Rodgers. The amount of love and care they give to all the dogs they save is amazing. If you don't know these amazing people, you'll want to for sure. SHAR will always be at our large events and even some medium size ones if we can get it to work out. Please visit their site if you wish to learn more about this organization and the dogs available.